We invite everyone to attend our educational and networking event for free the first time just to check us out. 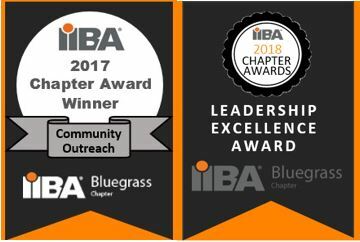 For members in good standing and annual passholders of Bluegrass IIBA Chapter. We encourage online registration to our events; therefore, this preregistration type will expire 24 hours prior to the event and member registration will be $10 within 24 hours of the event. For current college students. We invite and encourage all college students to attend our events, registration for college students will be $5 at the door. You are very welcome to join us at our events. Should you wish to join as a member, you will receive discounts on our events. We encourage online registration to our events; therefore, this preregistration will end 24 hours prior to the event and Guest registration will be $20 within 24 hours of the event. For members in good standing and annual passholders of Bluegrass IIBA Chapter. We appreciate and encourage online registration prior to the day of the event; therefore, this member registration is $10 now and at the door. You are very welcome to join us at our events. Should you wish to join as a member, you will receive discounts on our events. We appreciate and encourage online registration prior to the day of the event; therefore, this Guest registration is $20 now and at the door.